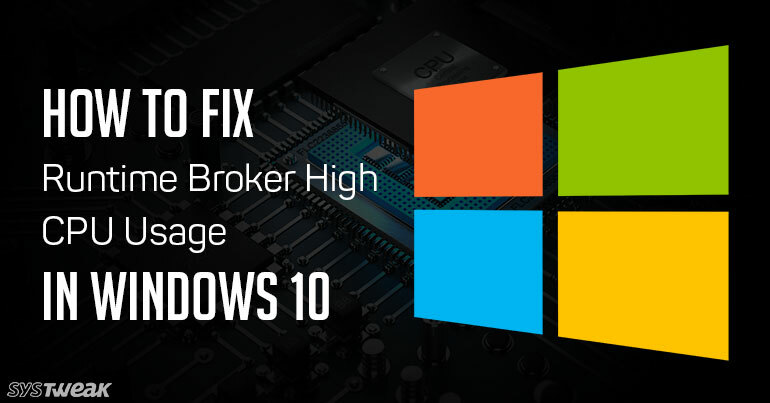 When using Windows 10 you might get Runtime Broker high CPU usage problem. Although it is a common for users to consider it as a virus, but in reality it is a genuine Windows process. In this tutorial, we will let you know what is Runtime Broker and How you can fix it. Runtime Broker is a windows system process in task manager that manages app permissions on your pc between Windows apps. For example: universal Windows apps which is pre-installed in Windows 10 and the other apps which you have installed from Windows store. RuntimeBroker.exe is an executable file, which is placed in the System32 folder of your Windows 10 PC. Also Read: How To Uninstall In-Built Apps In Windows 10? Runtime broker consumes most of the CPU usage due to which system goes slow. In normal conditions, Runtime Broker should not use more than a few MB, but if your RAM usage is high and your PC is running very slowly, an app may be the cause of the problem. To stop Runtime Broker from using so much memory, try out the steps listed below to fix this issue. Type in Regedit into the search box and press enter. On the right side of the pane, tap on Start and change the Value data from 3 to 4. Now reboot your system. Later, you can find the Runtime Broker process in the Task Manager. You will not find the Runtime Broker process there as it has been deactivated. Right-click on Start button and then tap on Task Manager. Now, tap on the Process tab and search for Runtime Broker in the list. Right-click on process and then tap on End Task. However, please note Runtime Broker killing process from the Task Manager is not a permanent solution. As when you restart your computer it will launch itself again and when you start using Windows Apps. Follow the steps for Settings as shown in Fix 3. On the Settings, click on Privacy. Scroll down to choose Background apps and toggle OFF the on-run apps. That’s all folks. Use the above-mentioned solutions and congratulate yourself because you have fixed the Runtime Broker consuming high usage. Take Scrolling Screenshot Of any Webpage Using Firefox Quantum.